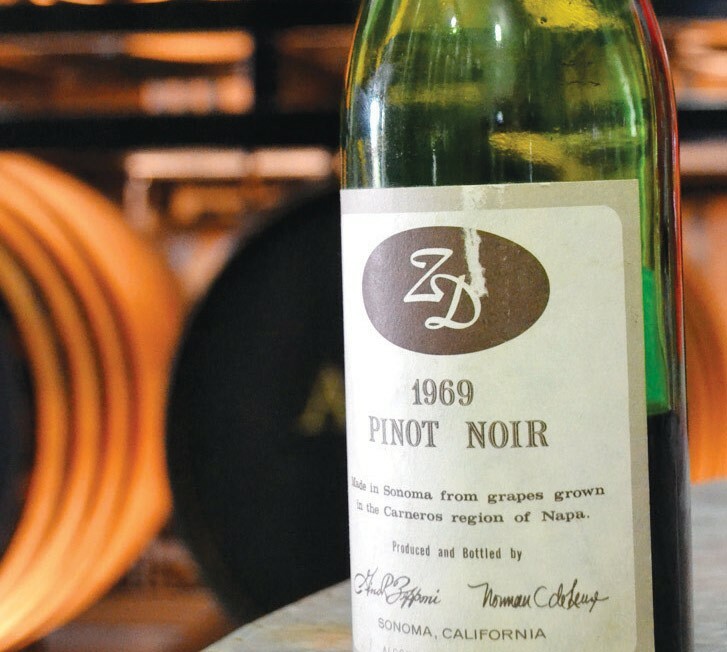 Last week, ZD Wines celebrated their founding 50 years ago and the completion of a new look for their tasting room. The only thing I remembered about the last time I stopped in was the cavernous, gloomy tasting room, so I hadn't been back in 10 years. Glass of 50th Anniversary Cuvée sparkling wine ($75) in hand, I am drawn to what looks like a real, roaring fire. Yes it is, winery CEO and director of winemaking Robert deLeuze tells me. But it was there before the remodel, which split the space and brightened it up. And this isn't even the real tasting room yet, says deLeuze, who left UC Davis in the middle of his studies in 1983 to help his father build the first incarnation of this winery on Silverado Trail. Soon we're joined by his son, Brandon deLeuze, whose title is winemaker, although they've still got senior winemaker Chris Pisani, who's been on the payroll here for 23 years. I think that's all the winemakers, but there are more deLeuzes working here to be sure, and they seem like good folks to work for. They're the "D" part of the equation. Back in 1969, Norman deLeuze and fellow engineer Gino Zepponi thought it would be fun to make two wines, calling their effort "ZD" for one obvious reason and one nerdy reason: "zero defects" in engineer jargon. And here we are. And here's that 1969 Pinot Noir, which the family is sharing thanks to some collectors with deep cellars. Sourced from Rene diRosa's Winery Lake vineyard, it has the bouquet of dried orange blossoms pressed in an old book for a long time, and lingers not a moment on the tongue before it's gone. Sticking around a bit longer is the earthy, meaty 2017 Founder's Reserve Pinot Noir ($90), from ZD's certified organic estate vineyard in Carneros. And although the winery's bread and butter is a lean and lemony style of California appellation Chardonnay, barrel fermented in American oak but without malolactic secondary fermentation—so, more bread than butter—the winery is upvalley, after all, so they make a 2015 Reserve Cabernet Sauvignon ($230) that's big on juicy licorice flavor but soft on tannin. The remodel on the upstairs tasting room must also have been expensive, but the sweeping Napa Valley view is worth it—zero gloom. That other wine made by Zepponi and deLeuze back in the day? Riesling, but alas, they haven't had that spirit here since, well, a while.